Web App for Containers provides a flexible way to use Docker images. In this tutorial, you'll learn how to create a multi-container app using WordPress and MySQL. You'll complete this tutorial in Cloud Shell, but you can also run these commands locally with the Azure CLI command-line tool (2.0.32 or later). To complete this tutorial, you need experience with Docker Compose or Kubernetes. For this tutorial, you use the compose file from Docker, but you'll modify it include Azure Database for MySQL, persistent storage, and Redis. The configuration file can be found at Azure Samples. For supported configuration options, see Docker Compose options. In Cloud Shell, create a tutorial directory and then change to it. Next, run the following command to clone the sample app repository to your tutorial directory. Then change to the multicontainerwordpress directory. A resource group is a logical container into which Azure resources like web apps, databases, and storage accounts are deployed and managed. For example, you can choose to delete the entire resource group in one simple step later. In Cloud Shell, create a resource group with the az group create command. The following example creates a resource group named myResourceGroup in the South Central US location. To see all supported locations for App Service on Linux in Standard tier, run the az appservice list-locations --sku S1 --linux-workers-enabled command. az group create --name myResourceGroup --location "South Central US"
You generally create your resource group and the resources in a region near you. When the command finishes, a JSON output shows you the resource group properties. In Cloud Shell, create an App Service plan in the resource group with the az appservice plan create command. The following example creates an App Service plan named myAppServicePlan in the Standard pricing tier (--sku S1) and in a Linux container (--is-linux). In your Cloud Shell, create a multi-container web app in the myAppServicePlan App Service plan with the az webapp create command. Don't forget to replace <app-name> with a unique app name. Browse to the deployed app at (http://<app-name>.azurewebsites.net). The app may take a few minutes to load. If you receive an error, allow a few more minutes then refresh the browser. If you're having trouble and would like to troubleshoot, review container logs. Congratulations, you've created a multi-container app in Web App for Containers. Next you'll configure your app to use Azure Database for MySQL. Don't install WordPress at this time. It's not recommended to use database containers in a production environment. The local containers aren't scalable. Instead, you'll use Azure Database for MySQL which can be scaled. Create an Azure Database for MySQL server with the az mysql server create command. In the following command, substitute your MySQL server name where you see the <mysql-server-name> placeholder (valid characters are a-z, 0-9, and -). 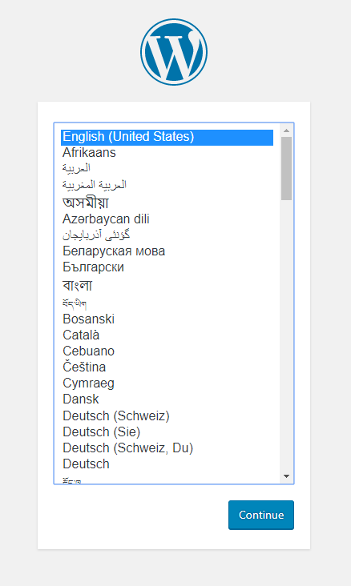 This name is part of the MySQL server's hostname (<mysql-server-name>.database.windows.net), it needs to be globally unique. Create a firewall rule for your MySQL server to allow client connections by using the az mysql server firewall-rule create command. When both starting IP and end IP are set to 0.0.0.0, the firewall is only opened for other Azure resources. You can be even more restrictive in your firewall rule by using only the outbound IP addresses your app uses. To connect the WordPress app to this new MySQL server, you'll configure a few WordPress-specific environment variables, including the SSL CA path defined by MYSQL_SSL_CA. The Baltimore CyberTrust Root from DigiCert is provided in the custom image below. To make these changes, use the az webapp config appsettings set command in Cloud Shell. App settings are case-sensitive and space-separated. az webapp config appsettings set --resource-group myResourceGroup --name <app-name> --settings WORDPRESS_DB_HOST="<mysql-server-name>.mysql.database.azure.com" WORDPRESS_DB_USER="adminuser@<mysql-server-name>" WORDPRESS_DB_PASSWORD="My5up3rStr0ngPaSw0rd!" WORDPRESS_DB_NAME="wordpress" MYSQL_SSL_CA="BaltimoreCyberTrustroot.crt.pem"
For more information on environment variables, see Configure environment variables. By default, SSL is used by Azure Database for MySQL. WordPress requires additional configuration to use SSL with MySQL. The WordPress 'official image' doesn't provide the additional configuration, but a custom image has been prepared fo your convenience. In practice, you would add desired changes to your own image. Adds Baltimore Cyber Trust Root Certificate file for SSL to MySQL. Uses App Setting for MySQL SSL Certificate Authority certificate in WordPress wp-config.php. Adds WordPress define for MYSQL_CLIENT_FLAGS needed for MySQL SSL. Adds PHP extension for Redis v4.0.2. Adds unzip needed for file extraction. 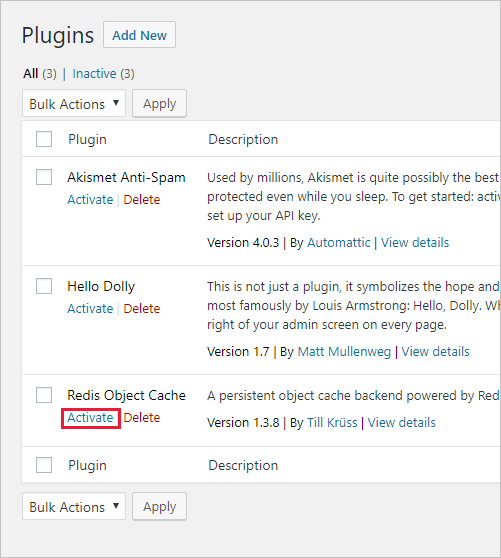 Adds Redis Object Cache 1.3.8 WordPress plugin. Uses App Setting for Redis host name in WordPress wp-config.php. Save your changes and exit nano. Use the command ^O to save and ^X to exit. In Cloud Shell, reconfigure your multi-container web app with the az webapp config container set command. Don't forget to replace <app-name> with the name of the web app you created earlier. Browse to the deployed app at (http://<app-name>.azurewebsites.net). The app is now using Azure Database for MySQL. Your multi-container is now running in Web App for Containers. However, if you install WordPress now and restart your app later, you'll find that your WordPress installation is gone. This happens because your Docker Compose configuration currently points to a storage location inside your container. The files installed into your container don't persist beyond app restart. In this section, you'll add persistent storage to your WordPress container. To use of persistent storage, you'll enable this setting within App Service. To make this change, use the az webapp config appsettings set command in Cloud Shell. App settings are case-sensitive and space-separated. In the Cloud Shell, type nano docker-compose-wordpress.yml to open the nano text editor. In Cloud Shell, reconfigure your multi-container web app with the az webapp config container set command. Don't forget to replace <app-name> with a unique app name. Browse to the deployed app at (http://<app-name>.azurewebsites.net). The WordPress container is now using Azure Database for MySQL and persistent storage. The WordPress 'official image' does not include the dependencies for Redis. These dependencies and additional configuration needed to use Redis with WordPress have been prepared for you in this custom image. In practice, you would add desired changes to your own image. To use Redis, you'll enable this setting, WP_REDIS_HOST, within App Service. This is a required setting for WordPress to communicate with the Redis host. To make this change, use the az webapp config appsettings set command in Cloud Shell. App settings are case-sensitive and space-separated. az webapp config appsettings set --resource-group myResourceGroup --name <app-name> --settings WP_REDIS_HOST="redis"
Complete the steps and install WordPress. Log-in to WordPress admin. In the left navigation, select Plugins, and then select Installed Plugins. 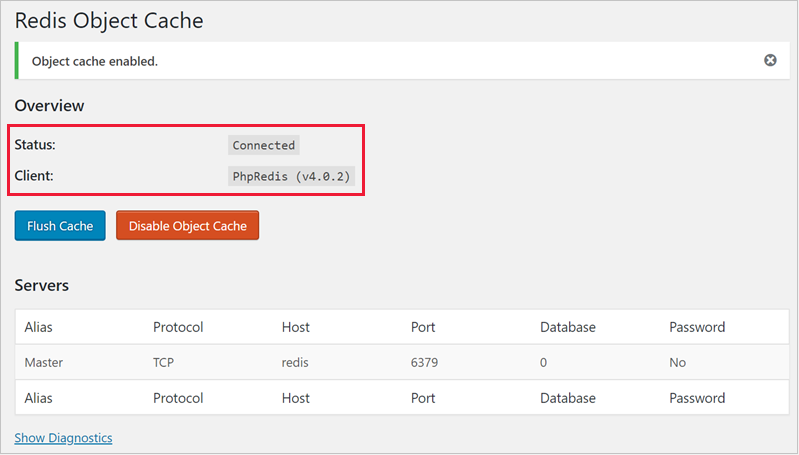 In the plugins page, find Redis Object Cache and click Activate. 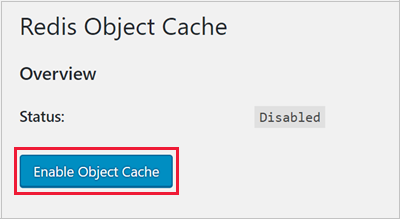 Click the Enable Object Cache button. WordPress connects to the Redis server. The connection status appears on the same page. Congratulations, you've connected WordPress to Redis. The production-ready app is now using Azure Database for MySQL, persistent storage, and Redis. You can now scale out your App Service Plan to multiple instances. In this section, you'll learn how to use a Kubernetes configuration to deploy multiple containers. Make sure you follow earlier steps in to create a resource group and an App Service plan. Since the majority of the steps are similar to that of the compose section, the configuration file has been combined for you. Create a server in Azure Database for MySQL with the az mysql server create command. If you haven't already, create an Azure Database for MySQL server. In Cloud Shell, create a multi-container web app in the myResourceGroup resource group and the myAppServicePlan App Service plan with the az webapp create command. Don't forget to replace <app-name> with a unique app name. To connect the WordPress app to this new MySQL server, you'll configure a few WordPress-specific environment variables. To make this change, use the az webapp config appsettings set command in Cloud Shell. App settings are case-sensitive and space-separated. Your multi-container is now running in Web App for Containers. The data will be erased on restart because the files aren't persisted. In this section, you'll add persistent storage to your WordPress container. The app is now running multiple containers in Web App for Containers. Congratulations, you've created a multi-container app in Web App for Containers. To use Redis, follow the steps in Connect WordPress to Redis. If you run into issues using multiple containers, you can access the container logs by browsing to: https://<app-name>.scm.azurewebsites.net/api/logs/docker. You see a log for each container and an additional log for the parent process. Copy the respective href value into the browser to view the log. After the sample script has been run, the following command can be used to remove the resource group and all resources associated with it. Advance to the next tutorial to learn how to map a custom DNS name to your app.